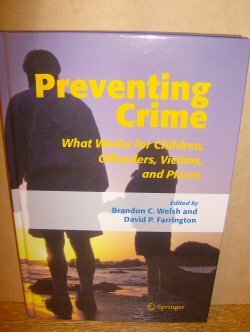 Edited By Welsh,Brandon C. And Farrington,David P.
Crime prevention should be rational and should be based on the best possible evidence. Decision-makers should weigh heavily any available evidence on what works best. How can a program that has produced no discernable evidence of effectiveness, as shown through numerous evaluations, be considered for implementation? Unfortunately, this happens all the time. Evidence-based crime prevention attempts to overcome this and other obstacles by ensuring that the best available evidence is considered in any decision to implement a program designed to prevent crime. This book is about evidence-based crime prevention. A project of the Campbell Collaboration Crime and Justice Group, "Preventing Crime" brings together the leading scientific evidence on what works best for a wide range of interventions organized around four important domains in criminology: at-risk children, offenders, victims, and places. It is the first book to assess the effectiveness of criminological interventions using the most rigorous review methodology of the systematic review. It is an indispensable guide to the leading scientific evidence on what works best to prevent crime. 243pp.